It has been claimed that style and distinction make a man, and some are more interested in bachelor party elements that refine manliness, rather than roughen it. Whether you are looking to class up a bachelor party you are planning, or just want to partake in the manly ritual of appreciating scotch, read on. Step 1: Learn how to drink scotch properly. A good scotch should be served in a tulip-shaped glass, which allows the drink to be swirled without spilling, as well as be â€˜nosedâ€™ properly. However, scotch is also commonly served in a rocks glass. Whatever flack you get, a splash of water is highly recommended (as seen on The Art of Manliness). Water cuts some of the strong alcoholic burn, allowing for the more subtle undertones of flavor to be enjoyed. While many are against the presence of ice in a scotch, some experts and distillers claim itâ€™s the best way to be drunk, allowing different phases of the scotch to be tasted as the ice melts (as sourced on Ask Men). To do so, a knowledgeable bartender recommended getting one double rocks glass of scotch, one glass of ice, and a spoon, then gradually stirring in ice to taste the subtle variations. 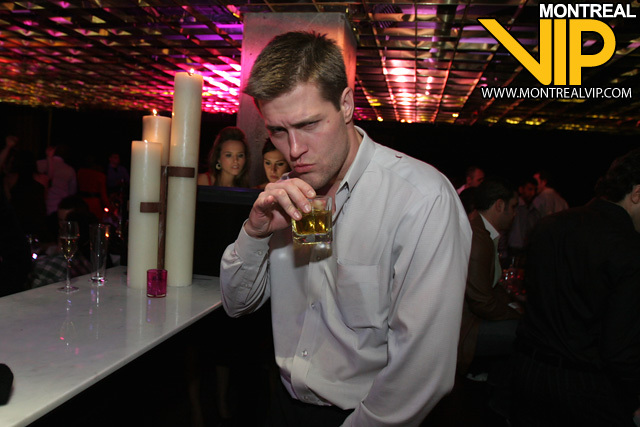 However you drink your scotch, make sure you drink it slowly, which will enable you to experience it to the fullest. Step 2: Find a good scotch bar. One of the best Montreal pubs for scotch is Lâ€™ÃŽle Noire, a relaxed but classy venue which offers over 100 brands of scotch, as well as an appropriately warm staff and atmosphere. Step 3: Bachelor party ideas? If you are interested in incorporating other â€˜manlyâ€™ traditions into your Montreal bachelor party, why not make it a â€˜Scotch and Cigars Stagâ€™? As well as quality scotch bars, donâ€™t forget that Montreal offers fine Cuban cigars, which can be enjoyed at select cigar lounges like Stogies. Or, give the groom a starter scotch for his new chapter of manhood. Itâ€™s rumored to help with the nerves. Share your opinion on the best place to get a scotch in this city on Facebook and Twitter.